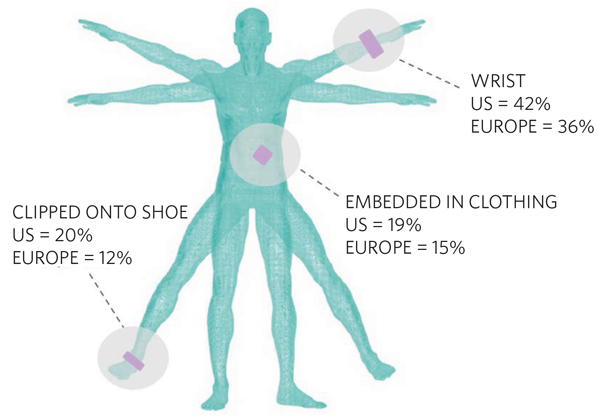 A recent survey by Forrester Research shows 36% of European consumers are interested in a wristband as a wearable sensor device. Surprisingly, the game of golf provides a unique perspective of wearable IoT technology trends over the next 3-5 years. There are about 80 million golfers worldwide, and so golf serves as a good case study for anticipating wearable tech trends because the market potential is large, the consumer base is global, and golfers are avid users of wristband wearable devices. The game of golf demands analysis of many sensory inputs, making analog sensor integration an important trend for GPS golf watches. Sensors can provide a golfer with knowledge of environmental conditions and swing mechanics, leading to better golf scores. Environmental conditions affect ball flight, shot accuracy, and distance control. Some relevant environmental parameters are ambient temperature, wind direction, wind speed, altitude, elevation, and distance. Golf swing mechanics can be improved with metrics of swing tempo, timing, and power. Swing metrics are acquired by processing multiple degrees of freedom using MEMS inertial sensors. Moreover, sensors are useful for monitoring a golfer’s physical condition. Golf is an outdoor sport played in moderately cold to hot weather conditions and a game that can be walked, making it a healthy activity. Walking an 18-hole round of golf is equivalent to a 3.5 mile run and burns up to 2,000 calories. For the avid walker, strength and endurance are requisites to scoring well. Consequently, sensory information of the body’s exposure to the elements and physiological condition are important wearable features. Some useful physiological parameters are heart rate, body temperature, and hydration level. A continuous heart rate monitor, based on photoplethysmography using reflectance mode optical sensors, can alert a golfer to fatigue or overexertion. The trend of dense sensor integration in sport wearables will require analog semiconductor solutions that faithfully capture and interpret real world analog signals such as temperature, light, heart rate, motion, and orientation. Furthermore, consumers expect the longest possible operating time before battery charging. A GPS golf watch must operate at ultra-low power with accurate battery management to ensure continuous operation beyond 10 hours in activity-mode and 30 weeks in watch-mode. As wearable devices trend toward more compact, lightweight, and comfortable form factors, they will need power efficient and highly integrated analog semiconductor solutions that occupy the smallest possible area.